Chile is a land of contrasts – from the glacial highlights of Torres del Paine in the South to the blue azure lakes of Patagonia right up to the Atacama desert in north, the driest place on earth. 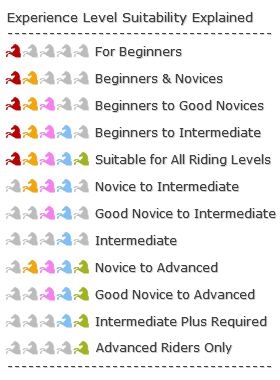 They all offer some of the best riding trails in the world on some fantastic, sure footed, Criolla type horses. There’s also the relaxed, warm welcome of the Chilean people and their great attitude not forgetting the widely enjoyed and drunk national drink the Pisco Sour! A horse riding holiday and adventure in Chile has everything to offer, remote, open plateau landscapes, sand dunes, lakes, rivers, volcanoes, mountains and more. Our horse riding holidays in Chile include The Glacier View Trail in the beautiful wilderness of Torres del Paine National Park, where you can get up close to two of the huge glaciers there: ‘Dickson’ and ‘Grey’. You’ll also see icebergs dotted through crystal clear lakes, tumbling waterfalls, and wildlife including magnificent condors, with their huge wing span, gliding overhead. There’s also the Estancia to Estancia Trail through Torres del Paine, bringing you an experience of everyday life as it is still lived by the locals of Patagonia, and all the challenges and even threats they face on their sheep and cattle farms. 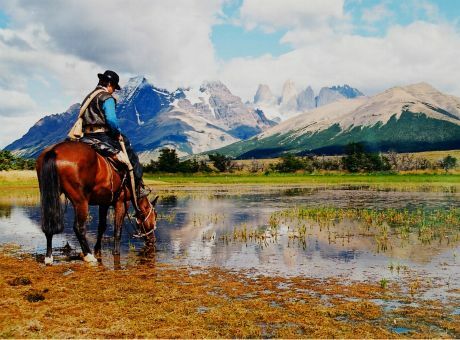 For yet another different experience, there’s the Horse Moving Adventure, where you will ride alongside free-running horses for three days as they are moved from the southern tip of Torres del Paine to the north. You’ll also be able to enjoy a number of other full-day rides, with some taking you right to the border with Argentina in the Sierra Baguales Mountains. 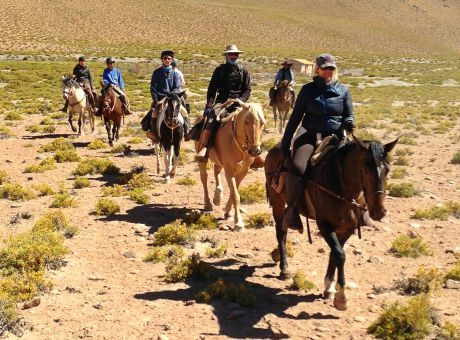 The newest addition to our horse riding holidays in Chile range is the Atacama Desert Safari, which will take you through this unique and lunar-like landscape over the course of a nine-night tour. Salt pans, historic villages, tribal communities and local wildlife will all be among the experiences you’ll enjoy on a holiday that is absolutely unforgettable. Our horse riding holidays in Chile are exhilarating and exciting, but we have to tell you they’re also tough. They’re for experienced and skilled riders only, who are fit enough to spend up to eight hours per day in the saddle, and who will be comfortable on fast-paced canters and gallops across the pampas plains. If that sounds like you, you’re in for a memorable time as you experience the pleasures of Chile for yourself, and we look forward to making it happen for you. Zara and I have personally vetted all our horse riding holidays in Chile so we guarantee their quality and enjoyment. Just get in touch with us and we can tell you more!